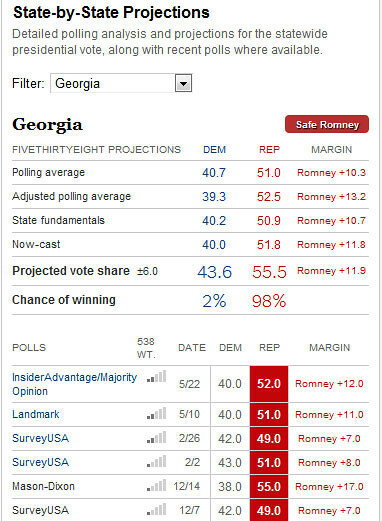 There aren't many certainties in life, but Mitt Romney winning Georgia this November is as close to a guarantee as one can get. New York Times polling guru Nate Silver, who runs the site FiveThirtyEight, released his analysis and projection for the statewide presidential vote this fall. Silver places Mitt Romney's chances of winning Georgia at 98%. Silver's projection is based on detailed polling analysis, including recent polls where available.